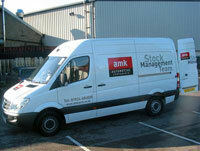 Dewsbury-based remanufacturer and distributor AMK has launched a new stock cleanse management team. Specially fitted-out vans are already visiting AMK clients to move slower moving lines back to the companies warehouse and free up valuable space. AMK marketing director Simon Salloway said: “We will keep our customers stock fresh, re-profiling and stock cleansing on a regular basis. AMK is one of the UK’s largest remanufacturer and distributor of braking, steering, transmission and suspension products in the aftermarket and hopes the stock cleanse initiative will bring it even closer to its customers.